Oracle is now the industry's second-largest SaaS vendor after Salesforce.com, but it made that announcement as fourth-quarter profits slipped slightly and on-premises software license sales ended the fiscal year flat. Revenue for the fourth quarter, which ended May 31, rose 3 percent to US$11.3 billion, while net income fell 4 percent to $3.65 billion. 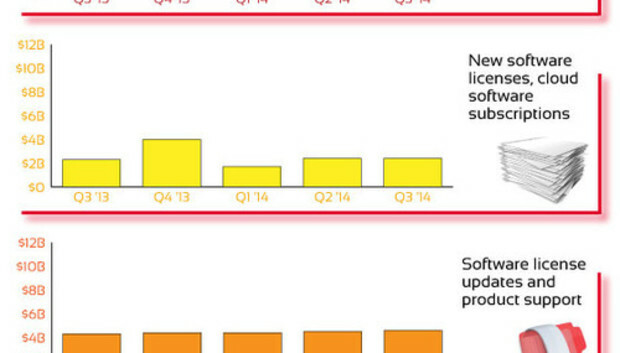 New software license sales in the quarter were $3.77 billion, the same as in the prior fourth quarter. Software license updates and product support was $4.7 billion, a 7 percent rise. But SaaS (software-as-a-service) and PaaS (platform-as-a-service) revenue rose 25 percent to $322 million and IaaS (infrastructure-as-a-service) sales jumped 13 percent to $128 million. "Oracle is now the second largest SaaS company in the world," CEO Larry Ellison said in a statement. "In SaaS, we're in front of everybody but Salesforce.com. In IaaS we're larger and more profitable than Rackspace. We plan to increase our focus on the cloud and become number one in both the SaaS and the PaaS businesses." The quarter showed signs of life for Oracle's hardware business, which had seen revenue drop steadily since the company got into hardware with the acquisition of Sun Microsystems. Hardware systems product sales grew 2 percent to $870 million, as did hardware systems support, to $596 million. Oracle has focused on selling "engineered systems" like Exadata rather than commodity hardware. "We have transformed Sun's commodity hardware business into a profitable and growing Engineered Systems business," Oracle co-President Mark Hurd said in a statement. "We saw record levels of Engineered Systems shipments and expect to deliver our 10,000th unit in Q1." For the full year, revenue was up 3 percent to $38.3 billion, while net income was flat at $11 billion. Executives are expected to discuss Oracle's results further on a conference call Thursday.